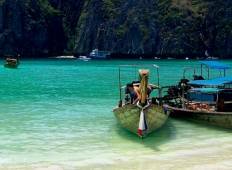 Find a Sailboat trip that explores Indochina. There are 8 tours to choose from, that range in length from 3 days up to 9 days. The most popular month for these tours is November, which has the most tour departures. "Awesome trip on sea! Amazing locations, mix of activities, great crew, chef who created..."
"This tour was the highlight of my trip to Thailand. The scenery was beautiful. The..."
"My time on the boat was amazing. 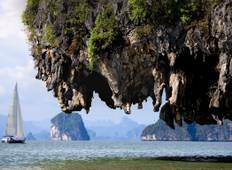 The staff was great and knowledgeable about sailing..."
"This was my third visit to the Mergui Archipelago. I came back reassured in my feelings..."
"A great cruise and the time spent on Freedom Island was amazing!" "Trip of a life time! Amazing food, crew, culture, and of course all the uninhabited..."
"We had a fantastic time with Phil and crew - would recommend to anyone!" "Really enjoyed the tour the area we sailed through was stunningly beautiful. The..."
"Sailing the Mergui archipeligo is a travel back in time featuring completely deserted..."
"This trip was the highlight of our travels in Vietnam. It was a perfect trip for..."